Author’s Note: This is a throwback article written in November 2013. New features in the updated version includes more photos on this page, as well as Google Map, pinpointing the exact location of the bridges profiled here. A link can be found at the end of this tour guide article. 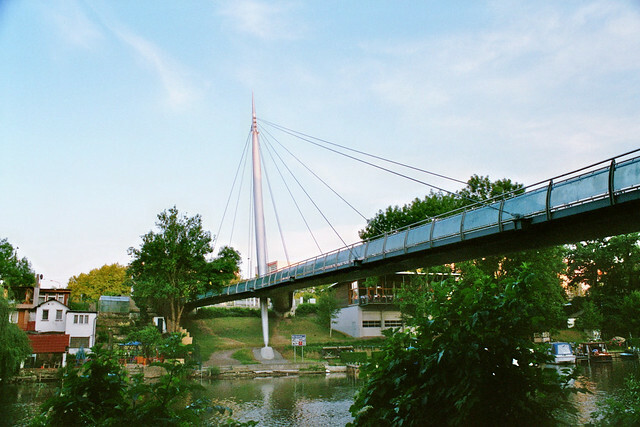 Apart from the Hafenbahn, Giebichenstein, and Mühlentor Bridges, the Peissnitz Bridge is one of the crown jewels as far as Halle’s bridges are concerned. 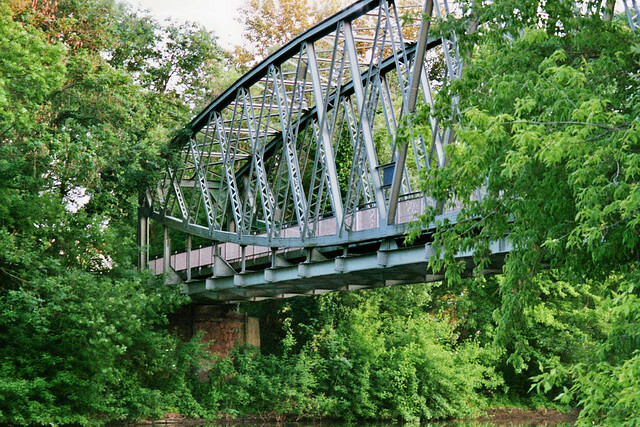 Spanning the Saale River at Peissnitz Island, carrying the street carrying the same name, the bridge is one of the most ornamental of bridges, for the 1898 structure features a cantilever Pratt truss design, with ornamental towers supporting street lights, and red quarry stone arch approach spans, presenting its grey and red colors which are typical colors of the city. 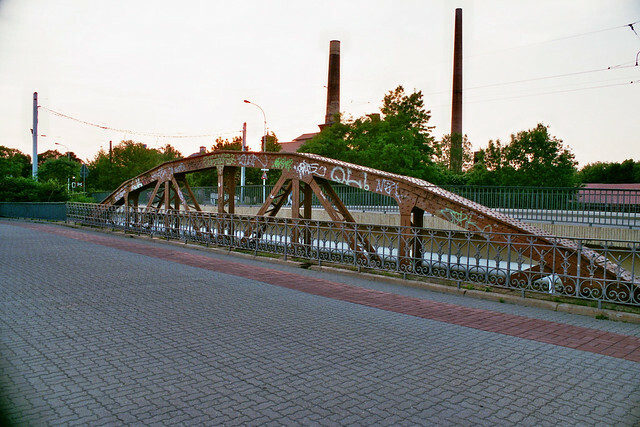 When built in 1898, the bridge was the only toll bridge in the city, as money was collected for people wanting to cross the bridge and enter Peissnitz Island. This was discontinued in 1921 and the bridge has operated as a free bridge ever since. The bridge is 103 meters long, 70 meters of which represent the main span. Despite sustaining damage during World War II, it was rebuilt in 1946 and was eventually converted to a pedestrian and bike crossing, which remains that way to this day. The Peissnitz Bridge is the only way in and out of the island which houses a vehicle museum complex and the island mini-train. Another bridge spanning the Wild Saale west of the bridge at Weinberg, known as the Elisabeth Bridge, a suspension bridge built in 1913, has been closed to traffic since 2011 and plans are in the making to tear it down and replace it. 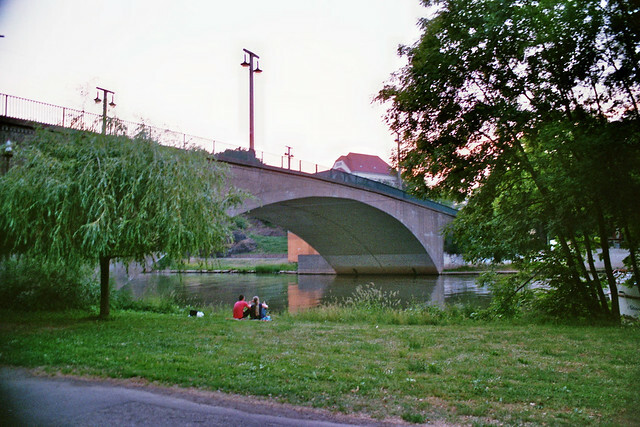 Like the Peissnitz Bridge, the Mühlentor Bridge, spanning Mühlgraben-a tributary of the Saale- at Neuwerk in the northern end of the city, is the most ornamental bridge but in the form of an arch bridge. Art Deco art on the bridge’s railing and four lamp posts can be seen when crossing the 1912 span by car or bike. The railings resemble a Howe truss made of concrete, a rarity one can see these days. 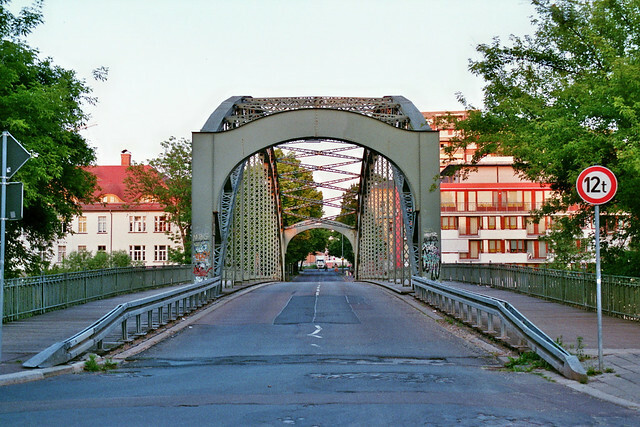 While some local newspapers have mentioned a bit about Halle’s bridges, more publicity is needed to bring the bridges to light and find out more about their history. 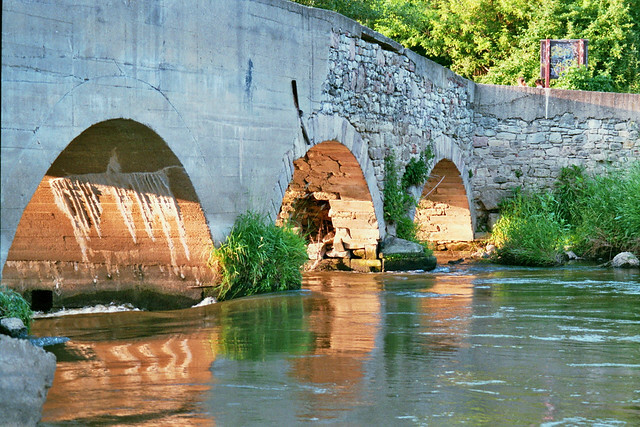 While a couple bridges have been documented, others still have mysteries that have yet to be solved. And even more so, perhaps someday when someone writes a book about the bridges in this community, this information will be useful.